We have all heard the term “no maintenance” decking. At Freedom Fence and Home, we have clients ask us all the time about “no maintenance” decking. There are even contractors and deck builders that advertise “no maintenance” decking. Well guess what? There is no such thing as a “no maintenance” deck. Every type of deck, from pressure treated pine to hardwoods to composite decking, requires some degree of maintenance. There are, however, low maintenance decks. Low maintenance decking is a great way to enhance your backyard without the constant maintenance associated with traditional wooden decks. And while low maintenance deck frames are still constructed with pressure treated lumber, the floor boards and railings are made of either PVC or vinyl. Please take a moment to browse our gallery of wood and low maintenance decks. Low maintenance decks are low maintenance. While it seems fairly obvious, we just thought we would drive this point home. The PVC and vinyl of low maintenance decks will never rot, warp or splinter. The PVC and vinyl of low maintenance decks do not require staining and sealing. Low maintenance decks are strong and durable. 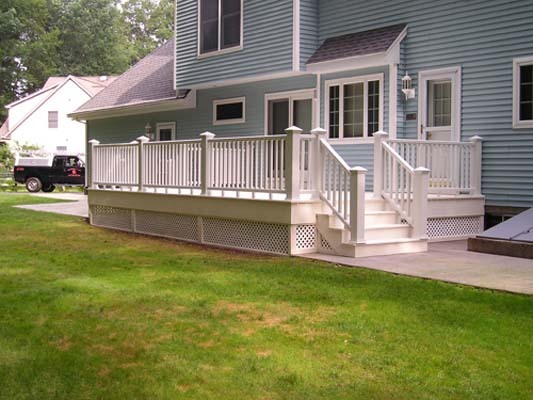 Low maintenance decks are available in an array of colors. The vinyl floor boards and railings are made from recycled materials, making them eco-friendly. Low maintenance decks are aesthetically pleasing. The combination of wood and PVC/vinyl provides your deck with a unique look. Low maintenance decks, unlike wood decks, have a high return on investment, typically around 70%. If you have any questions about Low Maintenance Decking, please contact Freedom Fence and Home by calling 443-271-6841 or visit our website. This entry was posted on Thursday, October 11th, 2012	at 9:04 pm	. Both comments and pings are currently closed.